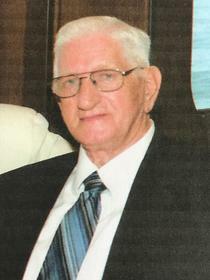 Harold Arthur Heusel, age 87, passed away on May 28, 2018 at the Pioneer Nursing Home in Rocky Ford, CO. Mr. Heusel was born September 25, 1930 in Freeburg, Texas to Albert Fredrick and Helen Adair (Staggers) Heusel. Mr. Heusel was the seventh child He attended Weatherford Oklahoma College, then went to Southard Oklahoma. Mr. Heusel worked at the U.S. Gipson where he met and married Thelma Louise Brown. They had four children and divorced after 14 years of marriage. Mr. Heusel met and married Janice Ball had one child together. Mr. Heusel then moved to Pasadena, TX to work for Houston Belt and Terminal. Mr. Heusel met and married Florence Oleta Bostick on October 8, 1977 she had a son Ricky Dean Bostick. In 1986 they adopted Marlisa Denise Heusel. After Florence passed away Mr. Heusel met and married Edith Peppler in Cannon City CO. In 1992, Harold and Florence retired from the railroad and moved to Howard, CO building a home in Acres of Ireland. The couple worked in many church in Texas and Colorado. They loved music, Florence would play the piano and Harold would sing. Mr. Heusel was a member of the Cotopaxi Community Church and was a 32 year member of the Salida Masonic Lodge #57. Mr. Heusel was a friend to all, always having a song in his heart for everyone. He had a heart for his Lord Jesus a great true Christian friend and was a very loving father, friend and husband. Mr. Heusel was proceeded in death by his parents, all of his siblings, Florence Heusel and son Ricky Bostick. He is survived by wife Edith Heusel, his children, Arthur Wayne Heusel, Jeannie Louise Stubba, Mary Elisabeth Mariano, Timothy Lee Heusel and Loweka Creekmore, Marlisa Heusel (Kenneth), 15 grandchildren, 32 great grandchildren and many nieces and nephews.